You can now bid Live Online, even if you are not able to logon to Live Bid on the night or attend the auction in person. Proxy Bids allows you to enter your maximum bid on a lot before the auction commences. The system will put you in at the lowest bid possible and then bid for you, up to and including the amount you specify. Your Maximum Bid will be kept secret from the other bidders, and the system will only raise your bid if another bidder outbids you. You can only place or update a bid up to 30 minutes prior to the start of the published sale time. You may access proxy bidding through the live bid catalogue. 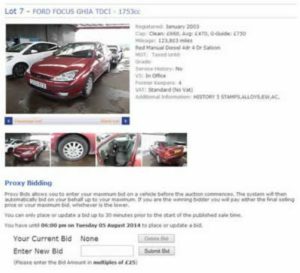 While on the catalogue, go to ’˜More Info’ on the lot that you wish to place the Proxy Bid On. Here you will be able to place and remove proxy bids on item in the auction.